In case you haven’t heard, Amazon.com has made it even easier for you to cough up some of your dollars over this past year—enter the Amazon Treasure Truck. For Amazon Prime members, the Treasure Truck provides yet one more way to experience the benefits of Prime: [A] order the item of the day via the app; [B] choose a pick-up location; and then [C] go to the chosen pick-up location during the designated time slot to walk away with your treasure. Depending who you talk to, Amazon Prime is in anywhere from just under half to over 60% of American households (#winning). As Kobie’s research has shown, this kind of popularity places Prime among the top loyalty programs today (yes, paid loyalty programs still count as loyalty programs). Diving a bit deeper into their answers, respondents consistently ranked Prime toward the top of their lists because of the program’s ability to hit on specific emotional drivers of loyalty, like increased convenience that then creates set-and-forget, habit-induced purchases. Seen in this light, Prime serves as the base part of Amazon’s loyalty ecosystem, and the Treasure Truck now expands this loyalty ecosystem into the experiential space. While I may have felt grateful and relieved that I can find high-quality, organic cacao nibs and moringa powder to subscribe and save on via Prime, the Treasure Truck takes aim at deepening my emotional connection with Amazon by creating a memorable experience IRL. 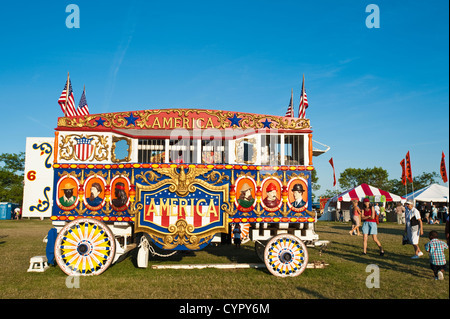 When the Treasure Truck rolls around town, it looks like an old timey, vintage circus wagon. And when it opens up, music blares out of speakers, bubbles churn from underneath the truck, and passersby inquire and play fun, but dumb, games. In other words, the truck opens up, spectacle ensues, and us regular folk have some fun…all the while Amazon makes $$$, heightens brand awareness and deepens its relationship with its customers. But how does the Treasure Truck drive loyalty? Great question. I mean, how much easier can it get? Simply by having a Prime membership—recall the majority of households in America already have one—members opt to receive text notifications for the Treasure Truck, alerting them to when the truck is going out on the town and what kind of swag it’s carrying that day. Imagine having a bad morning and getting an alert telling you the Treasure Truck is stopping right by your office, and today it’s selling a four pack of 6-oz. filet mignon steaks for $36? Or a GoPro Hero4 at 64% off? Or [insert some item you would randomly buy if made easily available to you at a discount]? Time to #treatyoself with some retail therapy, right? Bottom-line: The Treasure Truck drives loyalty by smartly blending the online retailer’s presence with a real-world experience that will be difficult for others to match in terms of its overall simplicity and value to the member. What’s that I hear you say? That sounds like omnichannel marketing? Yup, I definitely heard that. Invested in a well-oiled distribution network? Provided a way-too-easy-to-use app that has resulted in a near-ubiquitous presence on our mobile devices? Accumulated actual BIG DATA that now allows it unrivaled access to real-time customer purchase insights (i.e., trending item data anyone)? Started leveraging all of the above to now meet its customers IRL? Swiped –> on that one, en fuego. What’s also awesome about the Treasure Truck experience is that I, and others, can now envision just how flat-out cool an Amazon-Whole Foods experience can (will?) certainly be based on this real-world interaction with Amazon. Plus, Prime members who participate in this experiment are easily providing Amazon with yet more data that fills the quiver it uses to turn around and shoot us back more of what we don’t know we want. And this is exactly what I believe Amazon will be doing the best, even among those organizations who we would say are currently succeeding at omnichannel: Amazon will get relevance and differentiation meaningfully “right” across so many product categories, compared to Starbucks, Chipotle, etc., driving loyalty even deeper into some of its best customers. Now, I trust we have some haters who want to chalk this truck nonsense up as a pure gimmick, more blatant than the Globetrotters style of basketball and executed with less skill, to boot! But the truck does seem to have its place, and so long as Amazon continues mining its purchase data, I can trust that recently-trending products, along with the tried-and-true “While Supplies Last” call to action will drive the truck’s success (puns are done, full brake). For instance, the hot item of the day when our group went out was a Timbuk2 Blink Pack—well-reviewed across all sites as the perfect weekender travel bag and being pushed out to customers just as holiday travel season approaches. Perhaps more convincingly, other recent items included the near-sold out, holiday favorite Fingerlings and the new Super NES Classic Edition that also proved hard to come by this past holiday season. I’m sure many customers who have encountered the Treasure Truck simply think, “Hmpf, that’s kind of neat,”—some, perhaps a bit more refined in their accents and thoughts, exclaiming “Oh, Charles dear, how novel!” Still, the Kobians who joined me bore witness to my ordering, picking up, and walking away with the item in under 30 seconds (I did it all from my phone after trying out the pack), and we saw at least two others do the same with ease. Plus, I’d like to think there’s someone at Amazon, after an arduous product naming process, who got in a bit of a joke on Amazon customers since the real treasure in this whole truck idea isn’t at all the product, but instead the way in which customers are playing into Amazon’s ability to consolidate more share of wallet into its arms. Want to boost loyalty for your brand? We can help. We’re passionate about building exciting loyalty programs for brands and can do the same for yours. Contact us today.